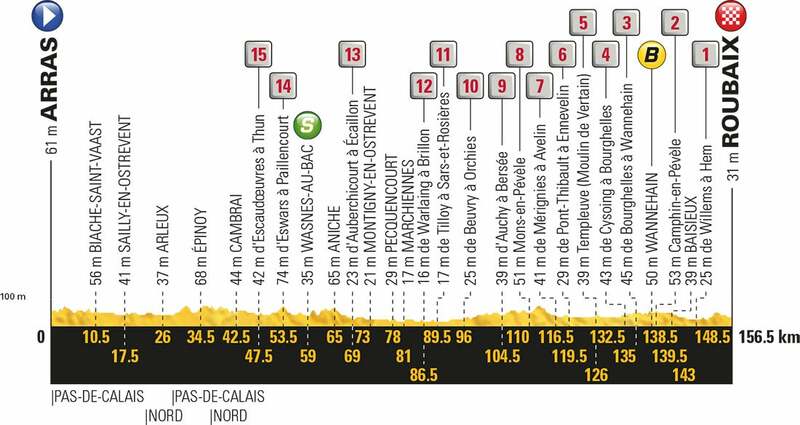 This short but intense stage could end more than a few Tours. Almost 22 kilometers of pavé, spread across 15 sectors, await the peloton. This slightly condensed version of Paris-Roubaix will include some of the legendary sectors from “The Hell of the North,” including those at Camphin-en-Pévèle (1,800 meters) and Hem (1,400 meters). The last sector comes a little more than six kilometers from the finish next to Roubaix’s velodrome. The distance of pavé will be a record for the Tour in the 21st century and is sure to shake up the contenders for overall victory. Something always happens on these northern roads. In 1979, Bernard Hinault lost three minutes on them after puncturing twice, though he went on to win his second Tour. More recently, in 2014, Vincenzo Nibali added a little more luster to his yellow jersey by taking a major advantage on the stones. Leader of the general classification since stage 2, the Italian put in an amazing ride, reaching the finish at the start of Roubaix’s infamous Arenberg Forest section in third place, just 19 seconds behind stage winner Lars Boom. More significantly, he was well ahead of his rivals for the overall title. In doing so, he laid the foundations for his final victory. Even though Nibali took a massive step toward his 2014 Tour success on the pavé, he is not sure how events will play out this year. John Degenkolb (Trek-Segafredo) won his first ever Tour de France stage and signaled a return to form following a horrendous training accident, out of a high-powered late breakaway into Roubaix on stage 9. Greg van Avermaet (BMC) finished in second, with Quick Step’s Yves Lampert in third. Van Avermaet increased his overall lead, while his teammate Richie Porte crashed and was forced to abandon. Stage-winner Degenkolb was overcome with emotion following his monumental day. “Pure happiness, really, I was chasing this victory so long, and it is really hard to describe. The 155-kilometer stage featured 22 sectors of cobblestones but was 100-kilometers shorter than the Paris-Roubaix race which covers the same cobbled roads. The Paris-Roubaix-esque stage and the anticipation of the brutal cobbles caused nerves to run high throughout the peloton at the beginning of the stage. This was exemplified by BMC team leader Richie Porte crashing and leaving the race after just a few kilometers of racing. When the race finally hit the first section of cobblestones with 100 kilometers remaining, AG2R La Mondiale team leader Romain Bardet immediately suffered a flat tire. Multiple mechanical problems shortly after doomed the Frenchman to an afternoon of furious chasing. The remainder of the chaotic stage saw nearly every general classification contender hit the deck at some point. Ironically, Nairo Quintana and Alejandro Valverde, both from the Movistar team that was predicted to struggle on the cobblestones, were two of the only riders to stay upright. Their teammate, Mikel Landa fell, but while taking a drink on a straight stretch of paved road. The final 40 kilometers saw Mikel Landa (Movistar) suffer a crash and be forced to chase for the final 32 kilometers. Despite being over a minute down at one point, he was able to limit his losses to the main GC favorites to seven seconds. Rigoberto Uran (EF Education First-Drapac) crashed on the cobblestones shortly after but lost over a minute by the end of the stage. Up front, chaos reigned as nearly every GC contender crashed as the peloton split and regrouped continuously. Shockingly, when the winning move went with 15 kilometers to go, every contender was present and accounted for in the front group expect a chasing Uran and Landa. While classics stars Degenkolb, Van Avermaet, and Lampert powered off the front of the group, green jersey leader Peter Sagan attempted to get back on terms. However, his chase proved to be too little, too late, as the three leaders quickly mounted an insurmountable advantage of close to a minute. Sky co-leader Geraint Thomas said he was in position to follow the move, but hesitated at the last moment. General classification contenders like Tom Dumoulin (Sunweb), Chris Froome (Sky), and Bob Jungels (Quick Step-Floors) launched multiple attacks from the chase group, showing they weren’t content to sit on wheels all the way to the line. At the same time, Bardet suffered his third flat of the day with 6 kilometers to go, and was forced to join the chase group containing Landa in an effort to limit his losses. Jungels eventually slipped off the front with a small group including Sagan and would steal a few seconds on the favorites at the line. The lead group of three worked together seamlessly until crossing under the 1km to go banner. Lampert shrewdly moved to the back, with Degenkolb stuck on the front, and Van Avermaet in perfect position behind. Degenkolb was visibly jittery in the final 500 meters and opened up the sprint from a long way out. However, he was able to use his raw power to hold off Van Avermaet all the way to the finish line and crossed to take his first major victory since suffering a brutal training accident in 2016. Tomorrow is a well-deserved rest day for the riders before the race enters the mountains on stage 10.